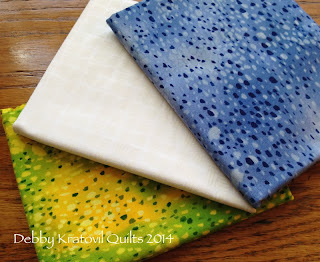 Sew in Love with Fabric (Benartex Fabrics blog) has invited me to participate in their Mug Rug Hop. 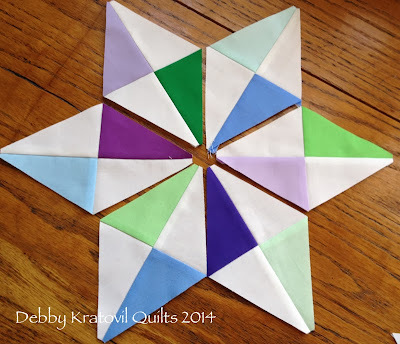 Please join me over there and you can see STEP BY STEP how to paper piece these awesome Royal Star points. 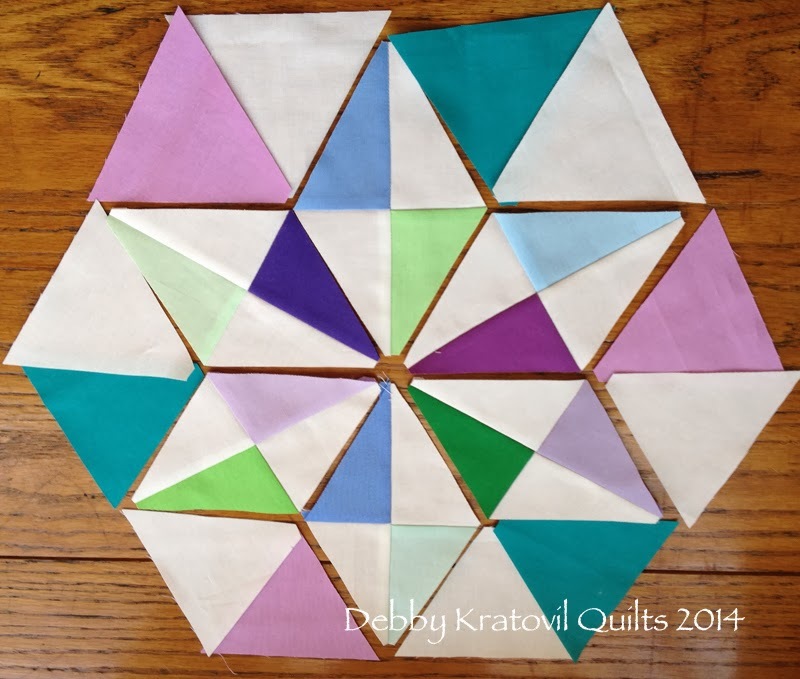 Then I give you the link to the FREE PATTERN for the entire 16 block quilt, including the foundations to make your very own Royal Star quilt. 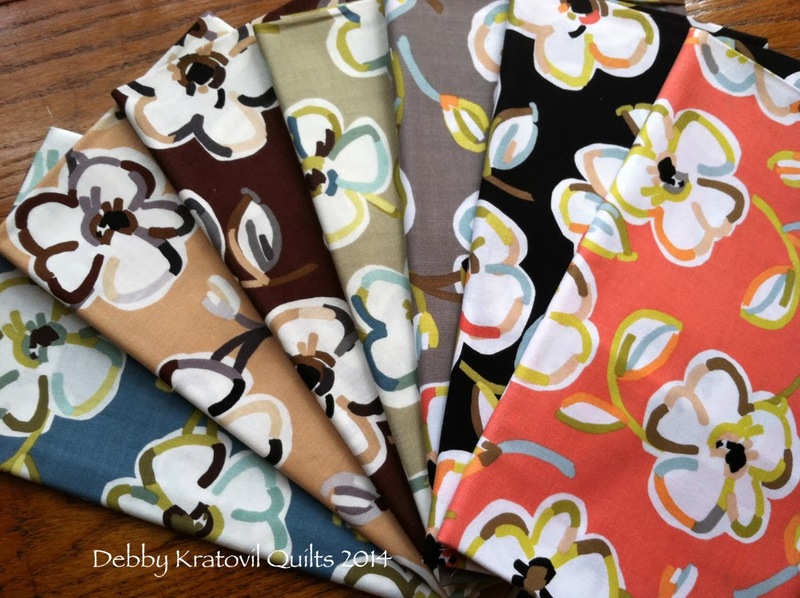 Take a hop on over to Sew in Love with Fabric to see it all! I have made several versions of this awesome and intriguing design. 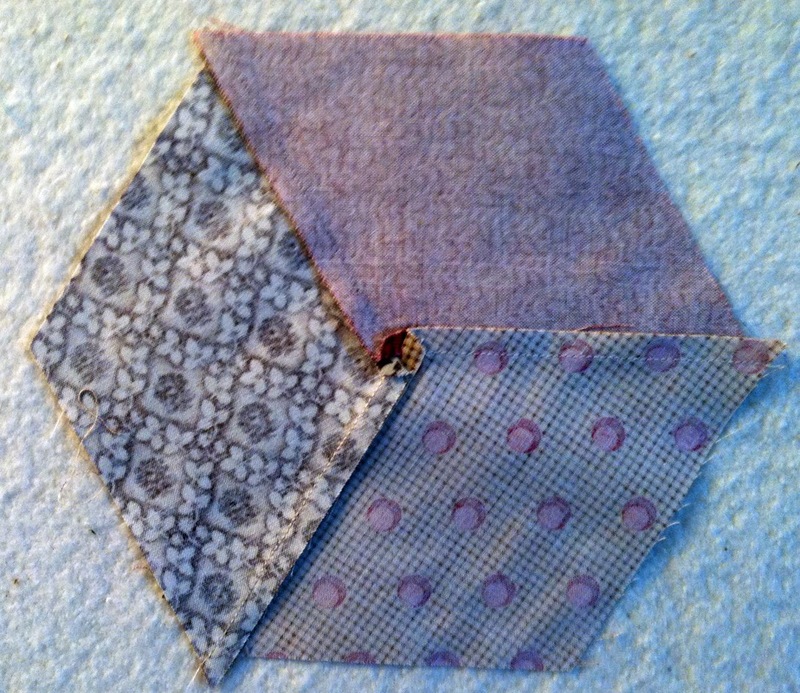 Tessellating means interlocking; the edge of one block forms the edge of the other block. You can see 4 red stars and a gold one in the center. 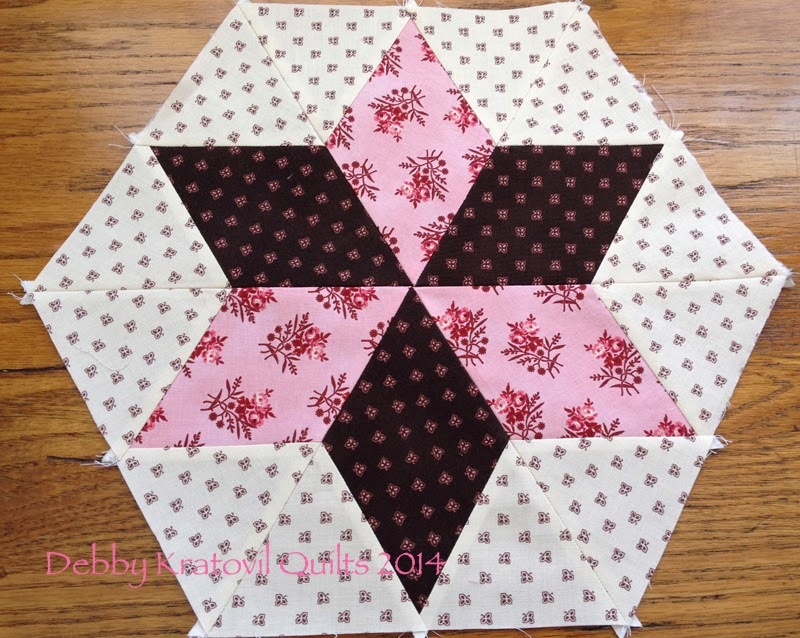 This Autumn Tessellating Stars quilt was so much fun because I limited myself to just two fabrics for the center: a floral print and black. Sometimes you see a black star and sometimes you see the floral star. Don't you love the way they interlock? 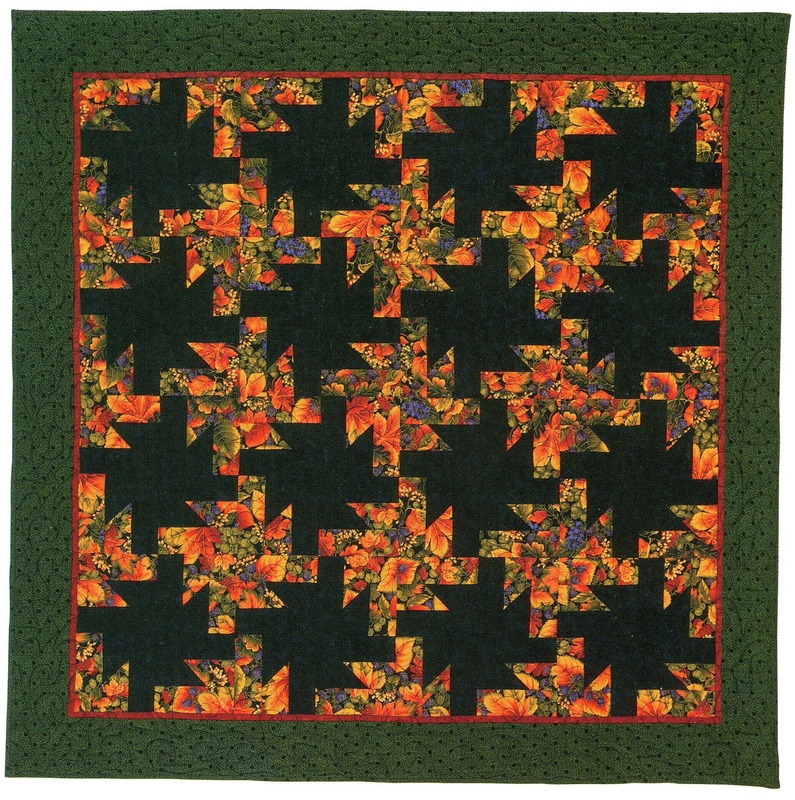 This was in my first book, "Bold, Black and Beautiful Quilts", AQS 2004. 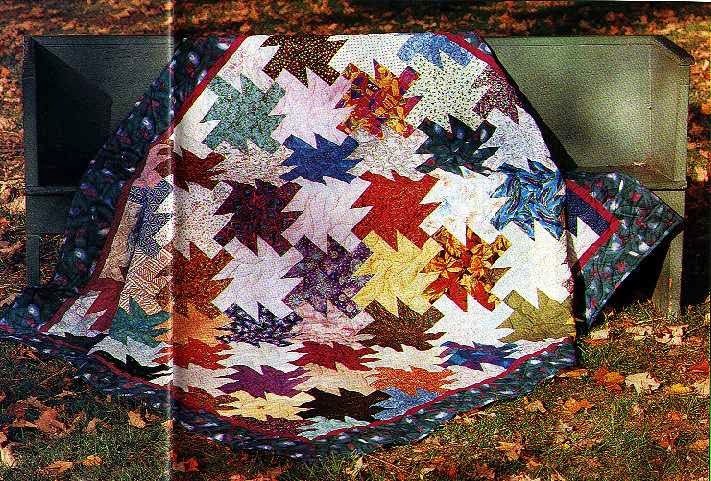 I own all rights and just feel like making it a free pattern. What do you think about that? Autumn Tessellating Stars: 58" x 58". 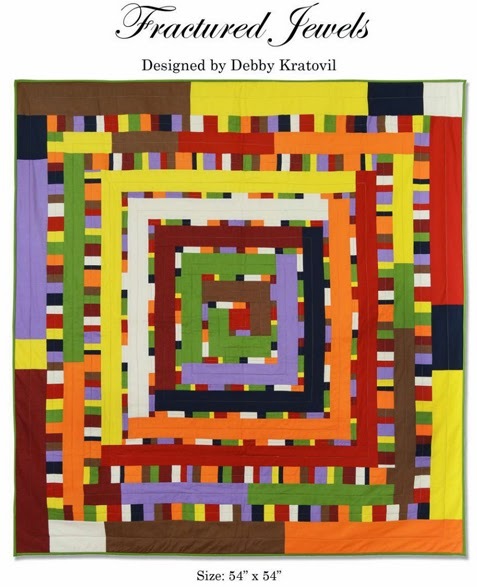 Block Size: 12"
I hope you enjoy this quilt pattern. I think I'm feeling the urge to make another one (well, maybe not today, but soon). What have I been up to lately? Well, snow is on the ground and the sun is shining. 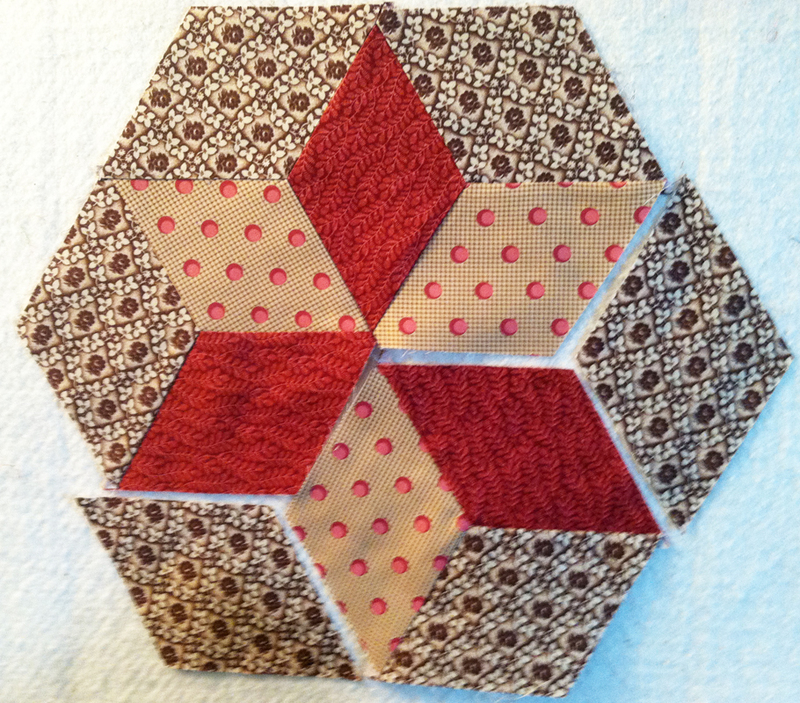 I rediscovered a box of precut diamonds and had an idea for some new blocks. 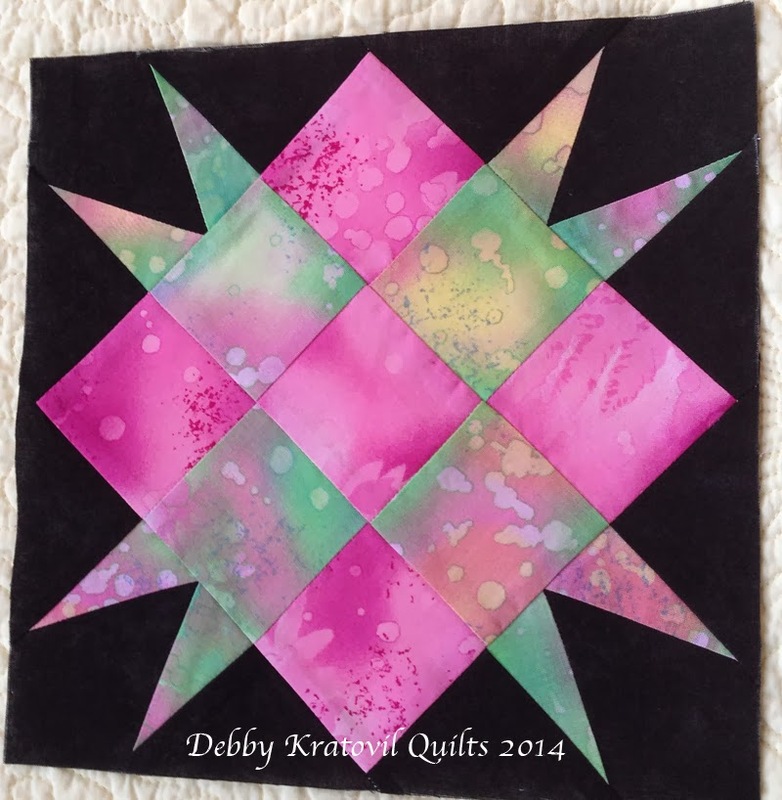 My friend Nancy Bills used her AccuCut and sliced up these diamonds for me last year. 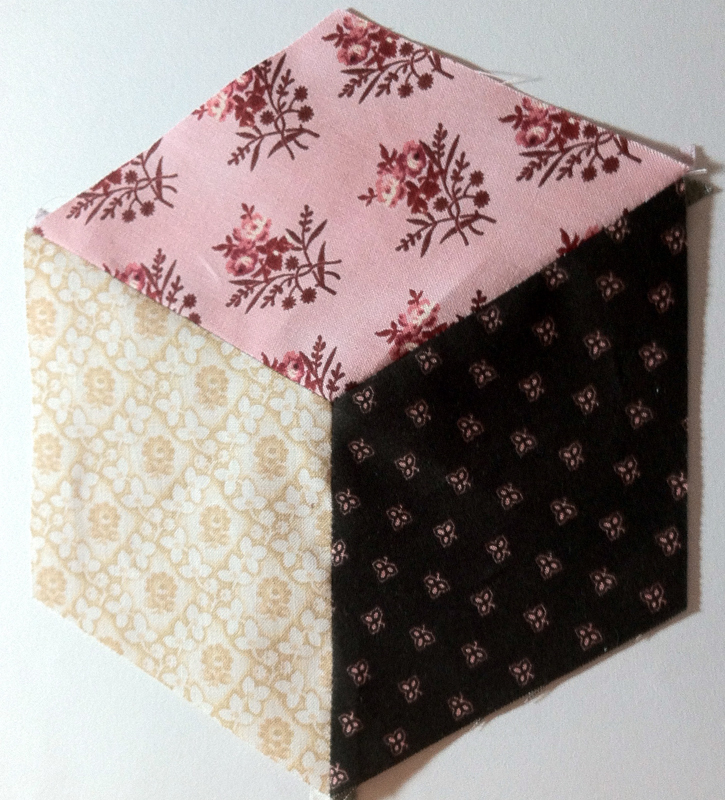 I played around with making some Baby Blocks, but I got discouraged with sewing y-seams. Two Baby Blocks. Now I'm sweating bullets! This is where my insides started to turn to jello . . . 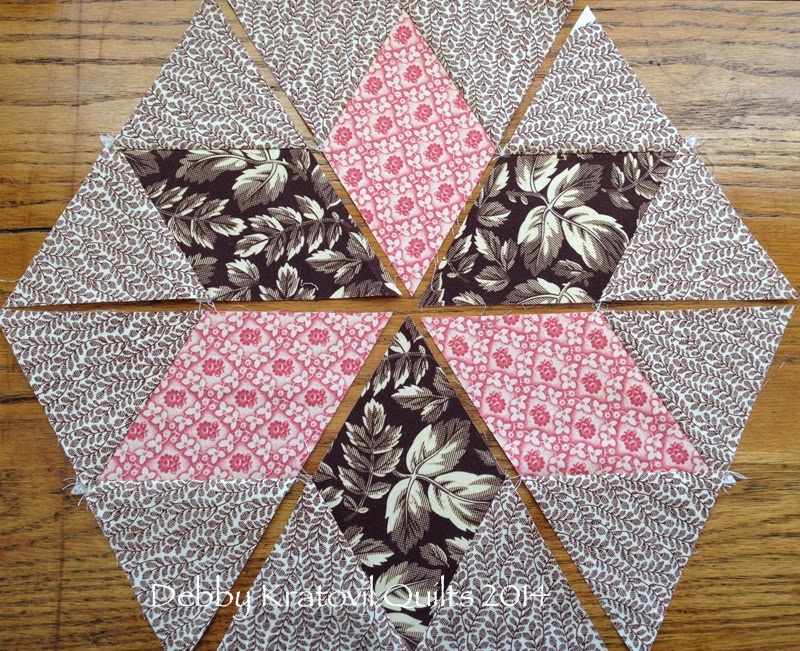 I started over using the diamonds and began cutting triangles for the outside diamonds. Two triangles equal one diamond. So what if I have a seam? It's all about saving my sanity! 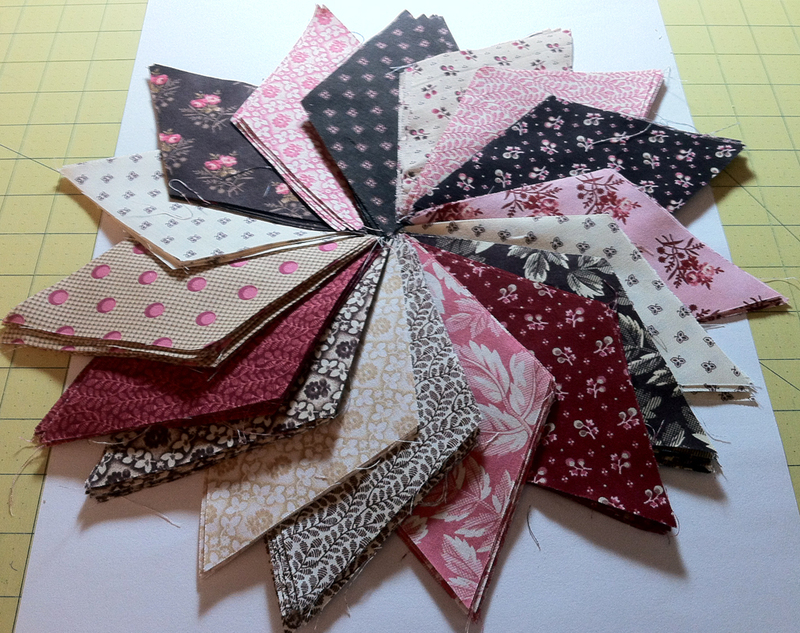 Notice that I will have ONLY STRAIGHT SEAMS. What's an extra seam if it saves my sanity? Please tell me that it's OK to look out for my sanity. And can we see the back side (not THAT back side)? Yes, I press a lot of seams open. It's my block and I can do what I want. 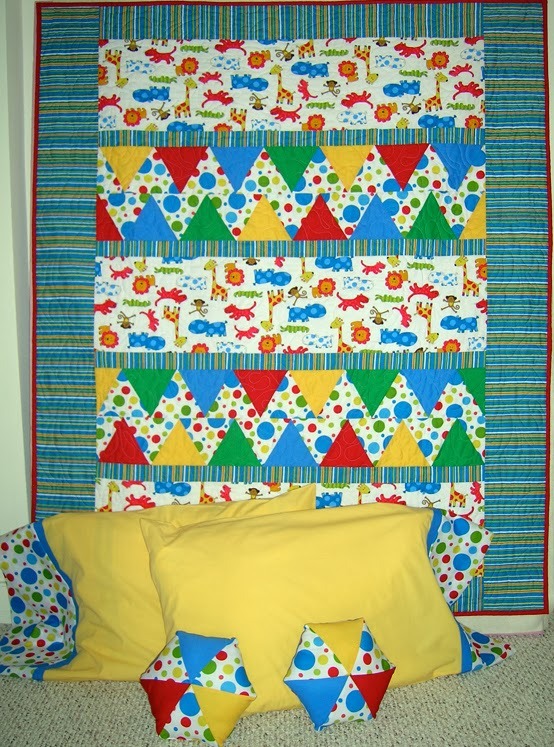 There are no quilt police! 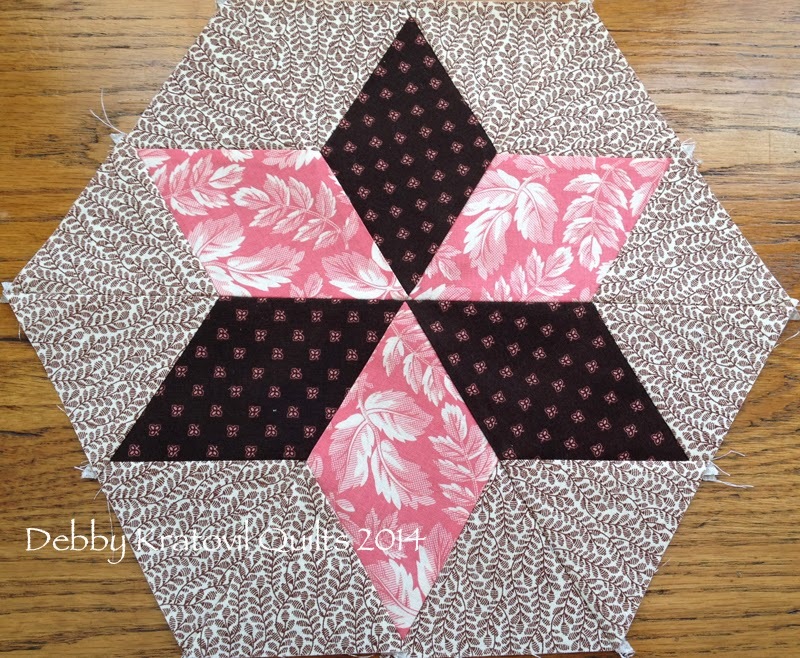 And here is another block. I have enough to make a total of 6 blocks. Don't ask me what I intend on making with them. I haven't gotten that memo yet! So, I hope you like what I shared today. 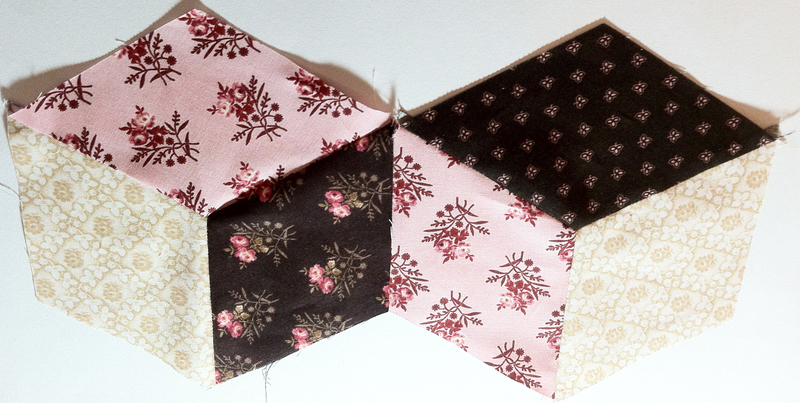 I have run out of fabric to make any more than these 6 blocks. I will have to use a similar one to set these together. I'll cross that bridge when I come to it. 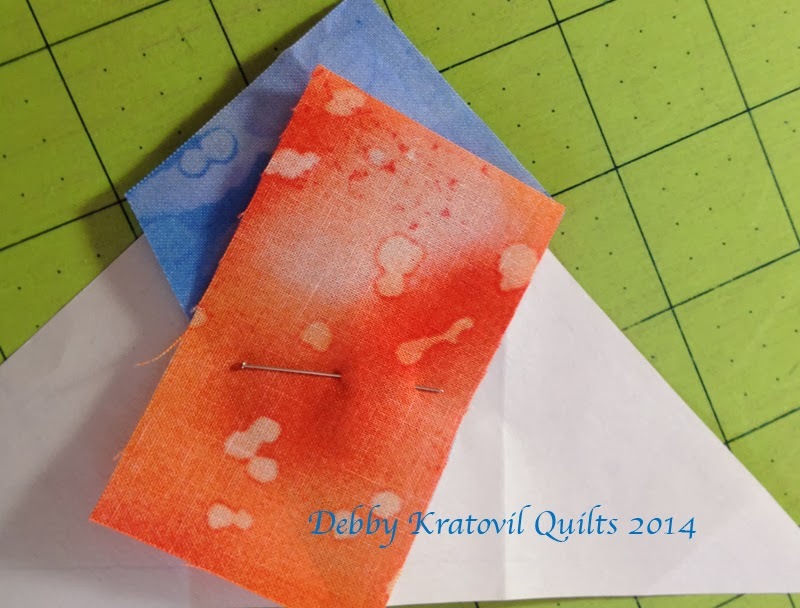 The Maker's Experience (Original Sewing and Quilting Expo) is featuring my step by step tutorial today on Magical Mitering. 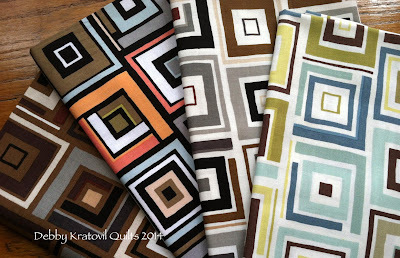 I did this for Benartex Fabrics this past summer and many of you may not have seen it. You can also see links to my classes which I begin teaching in March. 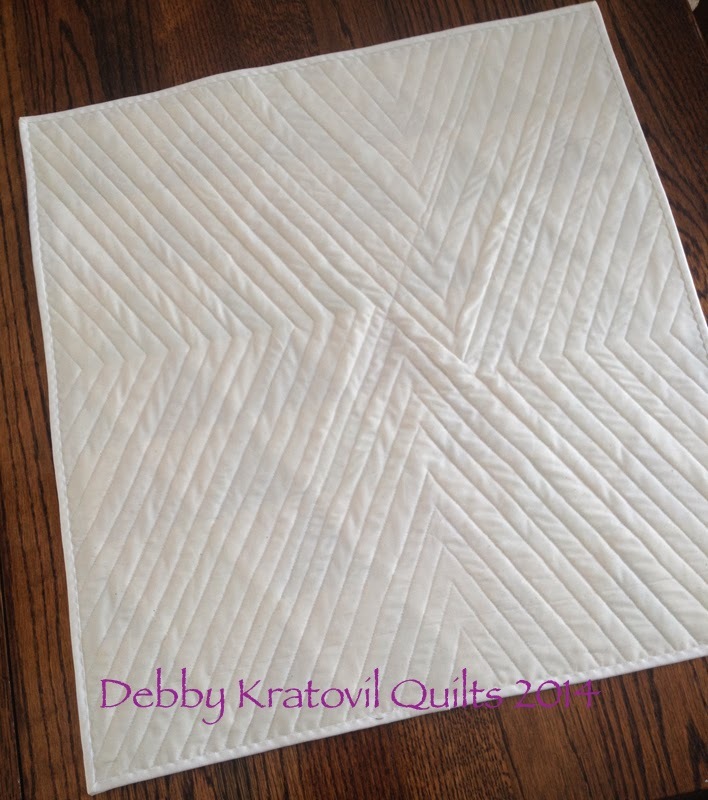 Take a visit and learn how truly easy it is to miter blocks or borders without using those pesky y-seams. Welcome to my Kona Solids Hop post. 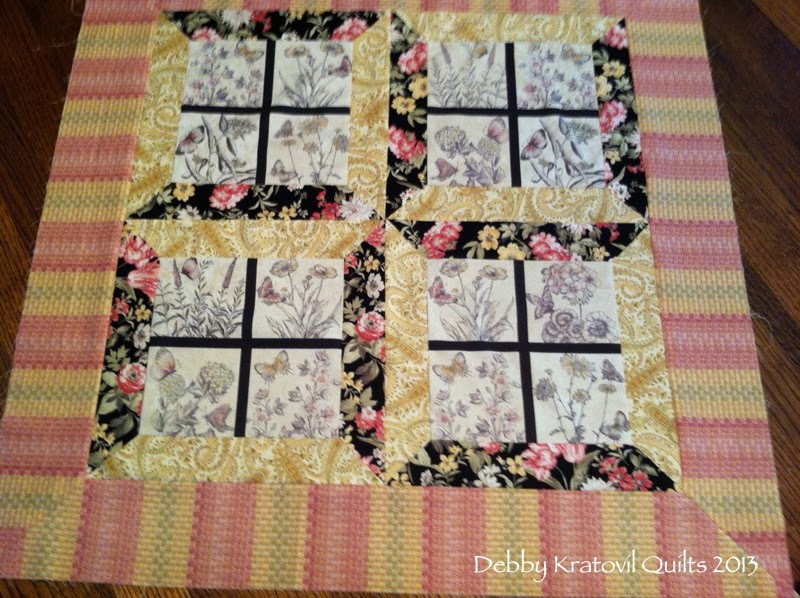 Many thanks to Madame Samm of Sew We Quilt and Carol of Just Let Me Quilt for keeping us in line. These hops are ONLY possible because of the partnership of our fearless leaders. And a big shout-out to my friend Jeannine (which you will see why at the bottom of the post). I tried to limit myself to just a little bit of fabric to force my brain to get creative. I have way too many large quilts; something small is easy to start - and finish. Just a little color, that's all I wanted. While I love the sunrise, it's the sunsets that have my favorite hues! Now, why did I slice a piece off? Hmmm. 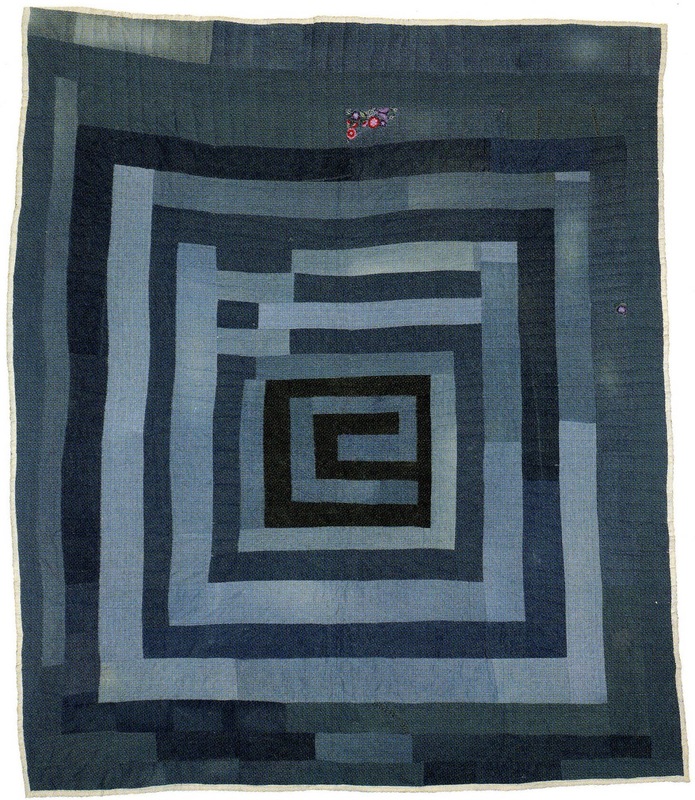 Check out the finished quilt below . . 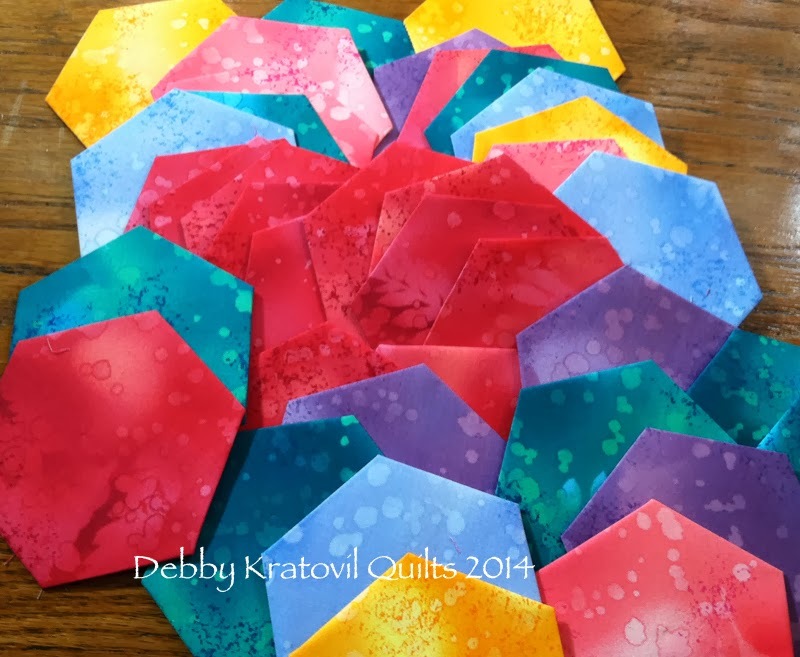 I used a 60 degree ruler to cut these triangles and combined them with Kona Snow fabric. Did I ever tell you I was a high school math teacher? I have no aversion to math; in fact, I love it all. Give me a formula - ask me to divide and multiply. Figure out angles. I'm in heaven. On to my story..
And, how does it all look together? Remember those cutaways? They are my border. Don't you love how even little bits of fabric can become something awesome?!! I have enough leftovers to make 6 of these blocks. They are 11-1/2" high. I'll keep you posted. 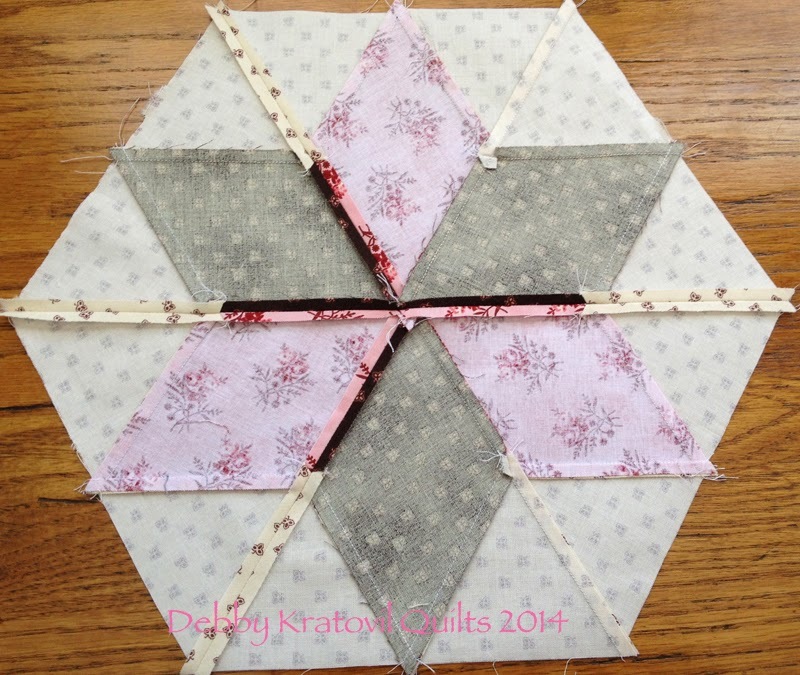 I agonized for 2 weeks about the quilting. I wanted something "modern". I told my friend Jeannine and she offered her Bernina walking foot, which fits my faithful Bernina 1230. What can I say? except THANK YOU, JEANNINE. This was truly amazing. 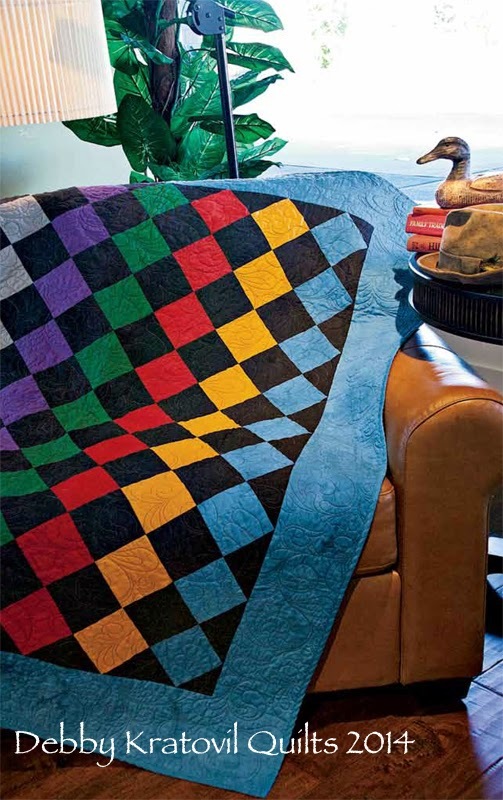 No folds, no pleats, no wrinkles - and it lies flat. 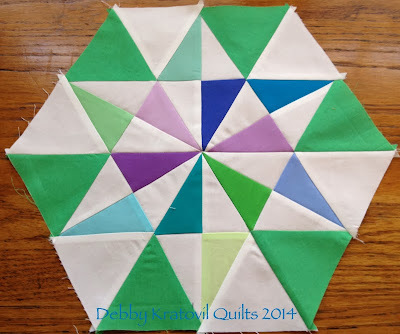 Yes, I teach free motion quilting (which I only do on my Pfaff 2144 and I get marvelous results), but this was a fun thing to do on my Bernina. 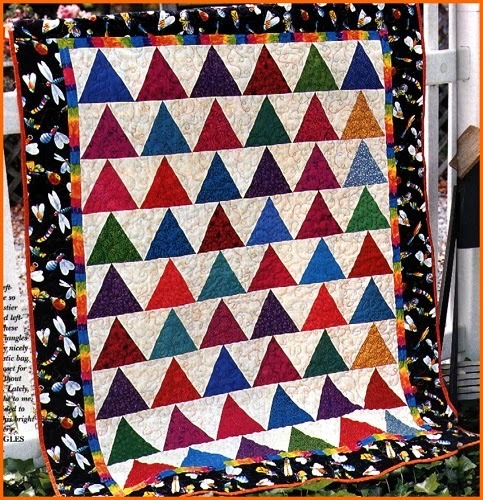 Thousand Pyramids is a traditional pattern that I've made several times. 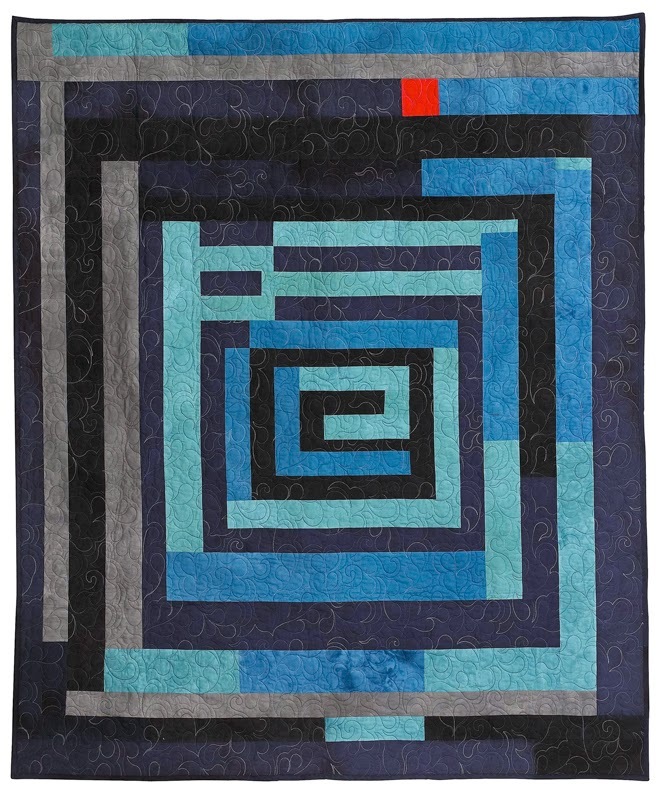 That is the name of this Kona quilt. 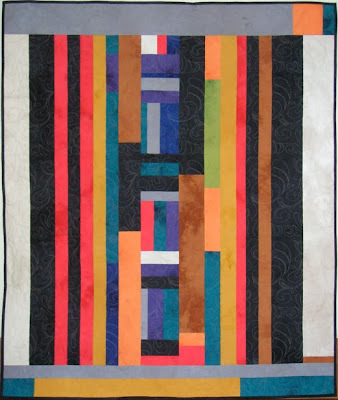 What do my other quilts look like? Just leave me a comment telling me whether you prefer sunrises or sunsets. That's all. If you're a no-reply blogger, make sure I have your email address (not a link to a web page or blog page). Contest is over January 22 (Wednesday) at midnight. And now let's see what my fellow bloggers are up to today! Based on an antique quilt I saw many years ago. Love it! At the risk of losing my work because Blogger has been filled with gremlins lately, I will stop. Please visit today's bloggers . 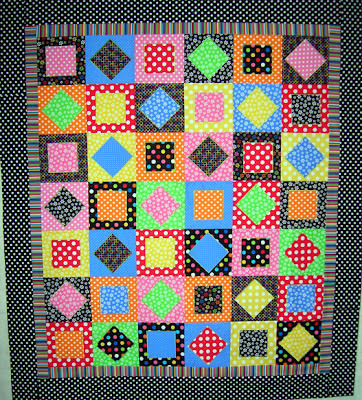 . .
My House and Your House - visit the Benartex blog - Sew in Love with Fabric today for Technique Tuesday where I'm the guest designer. You will see an awesome collection of florals, stripes, geometrics (like the Box Trot panels you see above). Here are a few of the prints . . .
Bloom print - I absolutely love that orange! 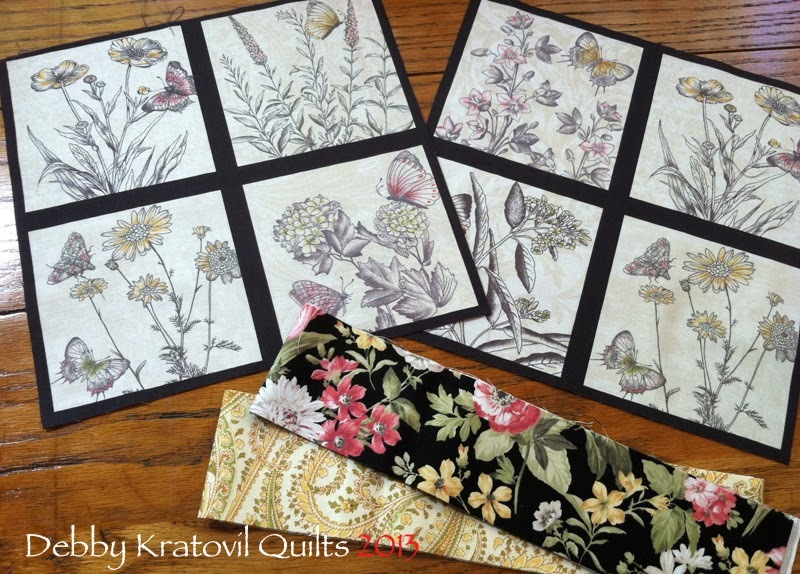 Check out Sew in Love with Fabric to see the 3 projects I made with this fabulous collection. Lots of pictures that I know you'll enjoy! 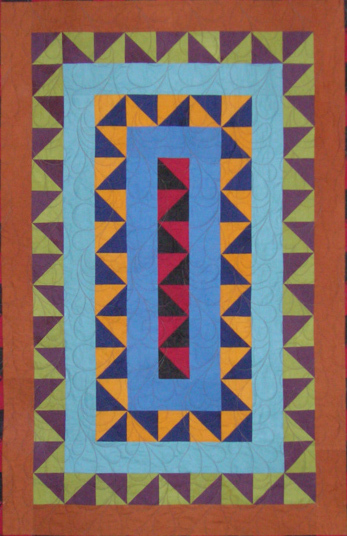 This 70" x 84" quilt is an adaptation of the quilt made by Rita Mae Pettway from Gee's Bend, Alabama. As I've shared on previous posts, Windham Fabrics and the Gee's Bend quilters entered a partnership to adapt 8 of their quilts for today's quilters for quilt kits and individual patterns. 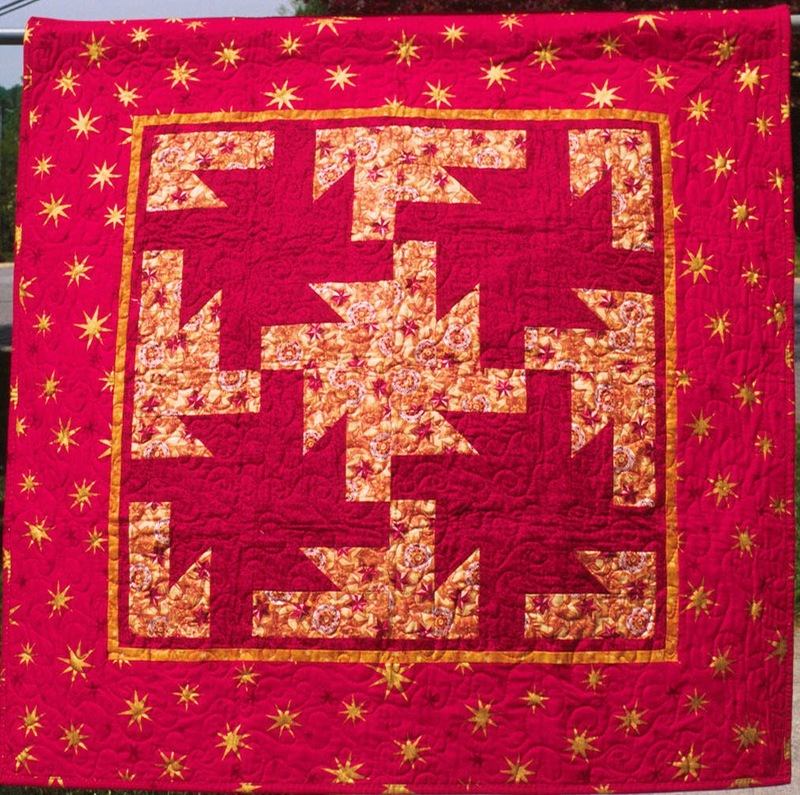 I was asked to do the design work (and I sewed all 8 of the quilts, some more than once). 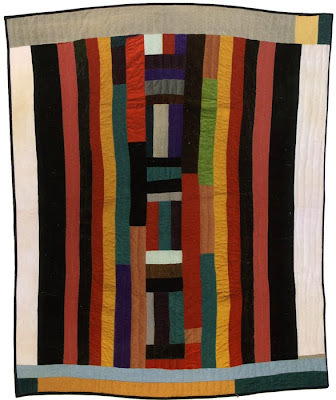 What does Rita Mae's original quilt look like and how close did I come to standardizing an improvisational quilt? We brightened up the colors and kept that red fabric at the top. Cool, huh? 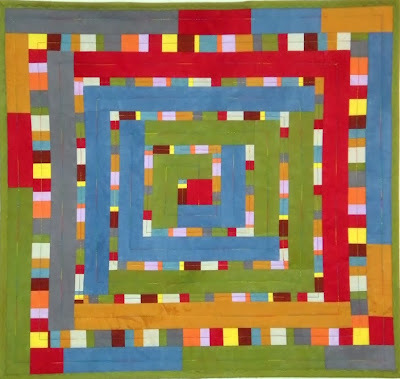 I was commissioned by Windham Fabrics to adapt 8 quilts made by the Gee's Bend quilters a few years ago. It was a partnership between the two and I am really surprised that I was able to stay true to the original patterns. 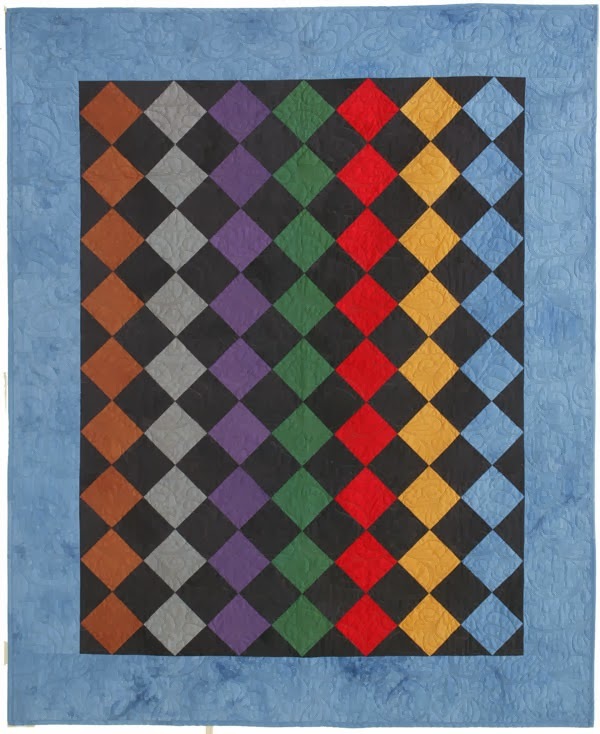 The key was to made a reproducible pattern for today's quilter with cutting and sewing instructions AND for the quilt to easily be recognizable as a Gee's Bend design. What do you think? Do they look the same? All solids, btw. Now it's time to visit today's bloggers on the Kona Solids Hop. Here is another quilt that I made using the Windham Gee's Bend Solids. 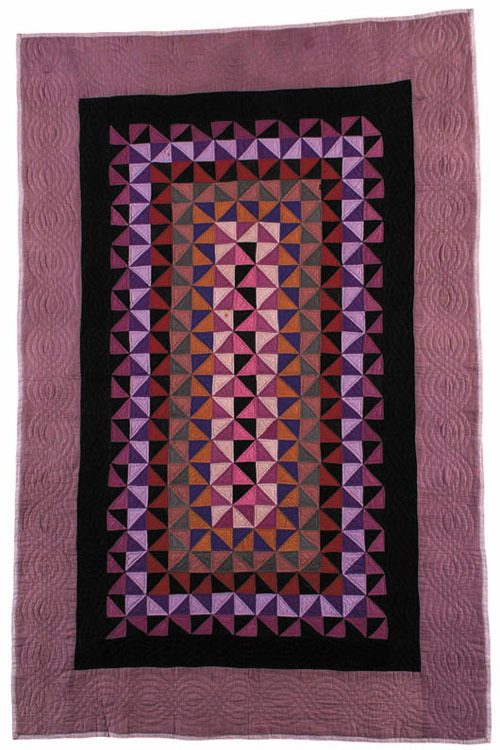 I based it on a traditional Amish quilt I saw in a book. Those colors are so drenched and pop out as they sit between the black squares. And seeing those squares set on point is so much more interesting than not, huh? 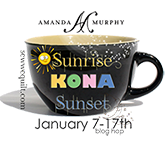 Now it's time to see what today's Kona Solids Bloggers have been up to! 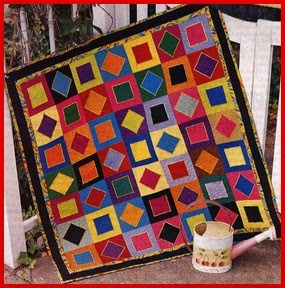 This is a FREE PATTERN at the Windham Fabrics web site. Just click on the link and you will go to the page where you can download the pdf file. And don't forget to visit today's bloggers to see what they've done with their Kona Solids! 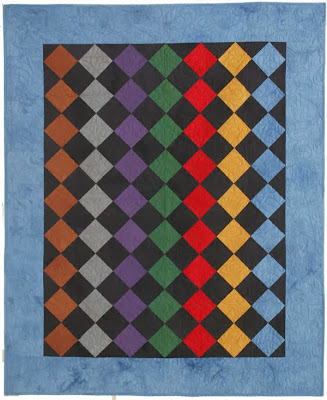 Here is the larger quilt I designed for Windham a few months ago based on my smaller version from yesterday. 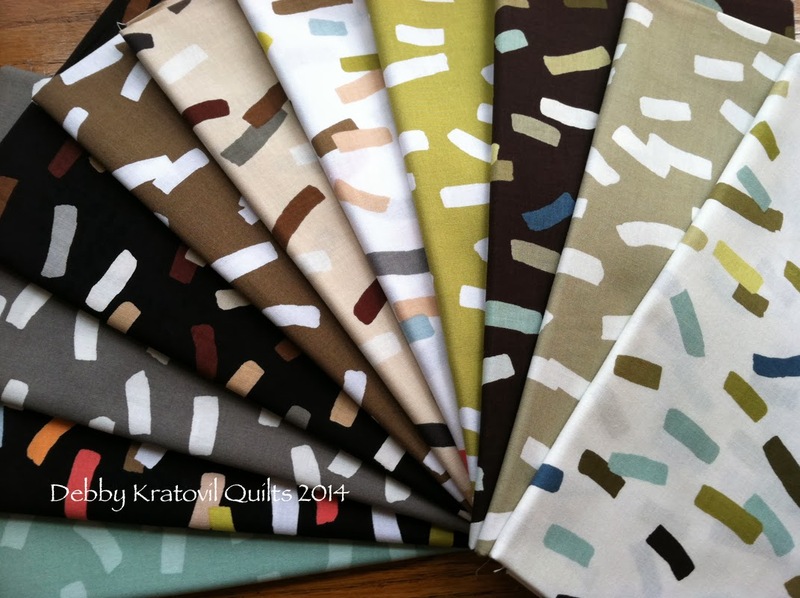 The fabric collection is called Colonies and the pattern's name is Fractured Jewels. 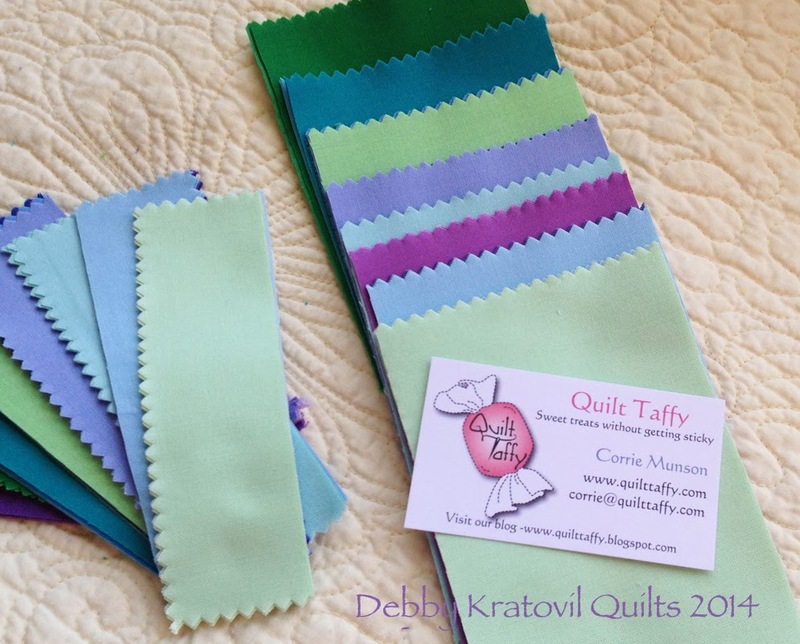 The colors are awesome and all solids. 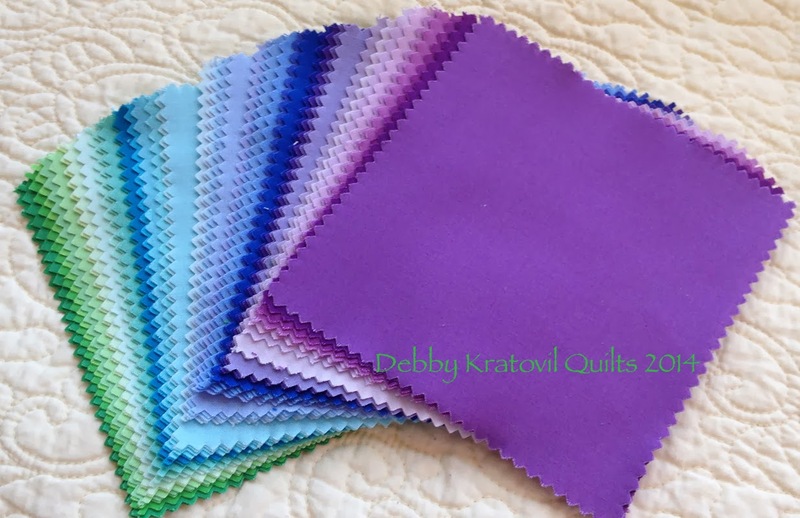 I have made many quilts throughout the years using only solids and I have surprised myself as to how many there are in my Solids Vault! 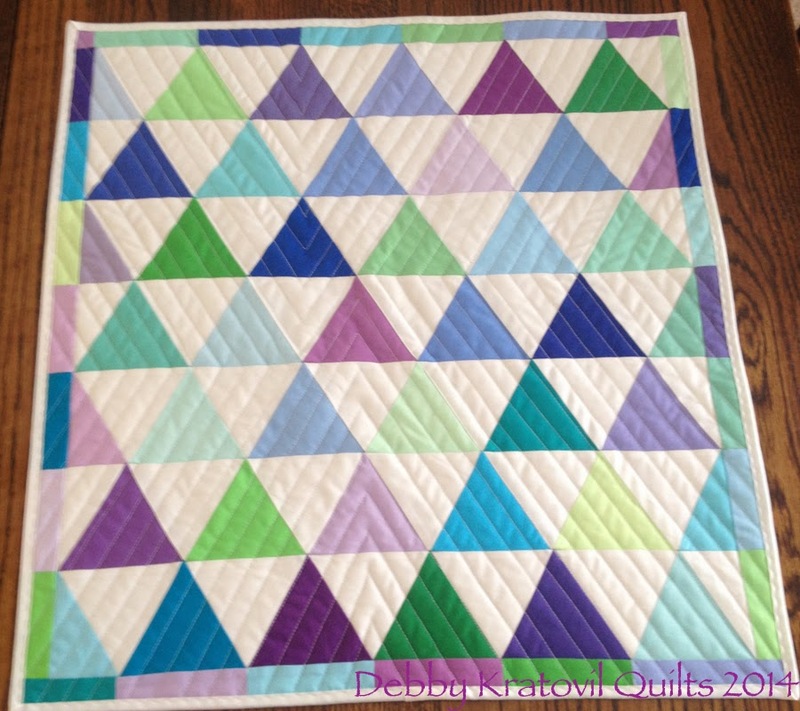 I blogged about this quilt in May of 2013 and showed a few of the steps. While it appears to be improvisational, I had to pattern it so that the end user could cut and sew strips without freaking out! 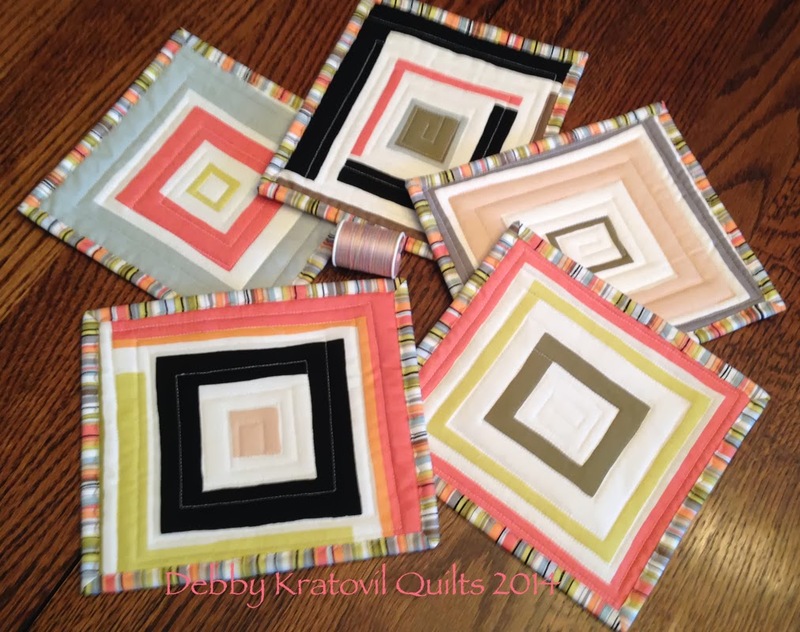 Now go visit the bloggers to see what they've come up with today in the Kona Solids Hop!